But for these sorts of wishes and messages it can be tough to know what to write. You may not know the right tone to strike, struggle with finding the correct words or just expressing the way you feel. Getting that down on paper (or card) and making it sound good is more difficult than it might sound. If you’re finding this to be the case then use one of the pre written messages below. You can copy them directly or change them to fit your situation. 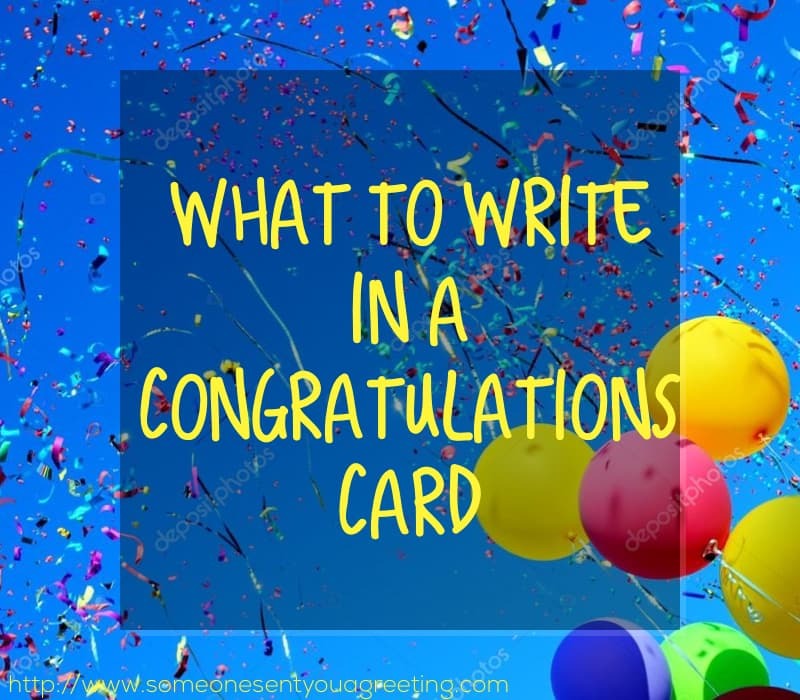 Alternatively you can follow the quick guide just under here that will show you how to write your own congratulations card and get the perfect sentiment. You can follow this short guide to writing your own congratulations message. Start your card by addressing the recipient you want to congratulate. Something simple like “Dear _____” is perfectly fine. You don’t have to stick exactly to this guide. You can add in extra parts if you want or keep it shorter if that fits better. But this general outline should at least give you an idea of how to write one. These are general congratulations wishes that can be used in most situations. They can also be added to or expanded in order to fit the person you are congratulating. But they can be a useful starting point if you are struggling with your own. For more specific examples (new job, wedding, retirement etc) scroll further down. All your hard work has paid off! Congratulations! You can use a quote in your card instead of or alongside a message as well. 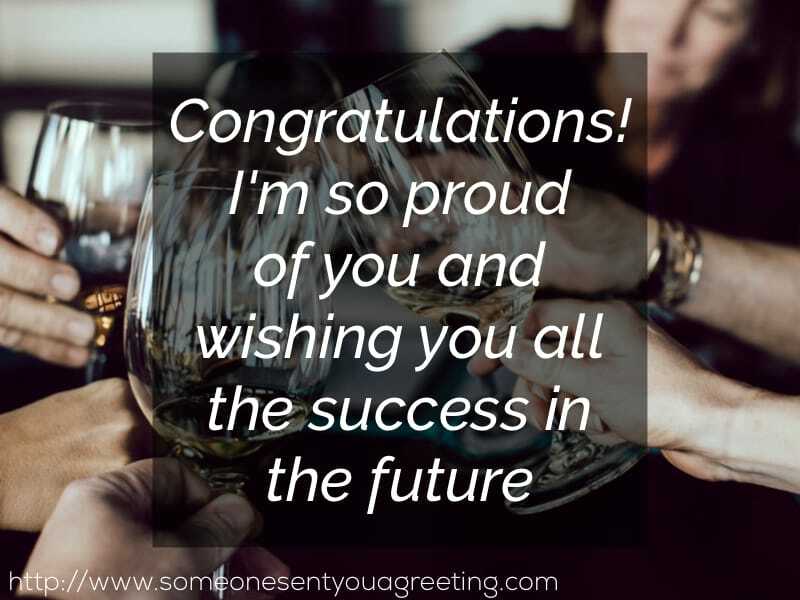 A congratulations quote can sum up your feelings very well and do a better job than you could. Graduating is a huge event in a young persons life, be it from high school or college. 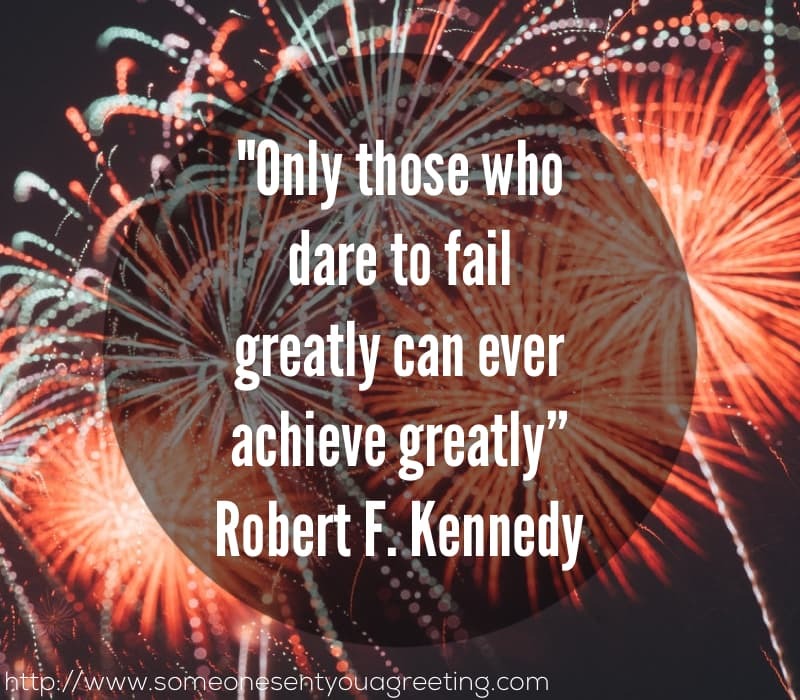 Celebrate and congratulate them on their achievement with one of these graduation messages. So proud of you! You’re a college grad now! For further graduation messages and wishes see our Graduation Wishes examples or our guide on what to write or say in a graduation card. If you’re sending a wedding card then you will want to congratulate the happy couple on their big day. Use one of the wedding wishes below. To a perfect couple on their perfect wedding day – congratulations! Enjoy your day and congratulations! Retiring after years and years of hard work is a big change. Some hate the idea and want to continue working whereas others can’t wait for the rest and free time. If you know someone like the latter then offer them congratulations on achieving a huge milestone in their life. Congratulations and now take it easy! Remember to keep in touch and don’t rub all that free time in our faces! No more work? Sounds like bliss to me! We’ve even more Retirement Wishes and a guide on what to write or say if you’re looking for a bit of extra help. Getting a new job or promotion is such an achievement and something people often strive a long time to get. Let them know how well you think they’ve done with a card and include a message of congratulations. I know how much you’ve wanted this position so just wanted to congratulate you on getting it. Well done! Congratulations on never giving up and eventually reaching that goal. New job? Drinks are on you! For more new job messages and wishes see our New Job Wishes examples for a guide on what to write or say. There’s nothing quite like a new arrival! A new baby is one of the biggest causes for celebration. If you know a couple having a new child then let them know how happy you are for them with one of the messages below. You’re going to make incredible parents. And if you need a babysitter at any time – just ask! Need more examples of baby congratulations and wishes then see our New Baby Wishes for loads more. Moving into a new house whilst stressful is also a really exciting change. It may be a first house or just a step along the ladder but either way wishing someone congratulations is a great way to celebrate their big event. Congratulations on moving into the house of your dreams! Congratulations on your first house! They say home is where the heart is, and I know you had your heart set on this home. Congrats! For even more new house congratulations and wishes our Housewarming Wishes are perfect.